Whether you’re a fan of nonfiction, novels, film, poetry or all the above, the just-announced National Writers Series lineup offers plenty of genres and intriguing topics to keep your mind stimulated this fall. All events are in City Opera House at 7 p.m. unless otherwise noted. It’s an interesting time for local writer and Interlochen Academy for the Arts graduate Doug Stanton, whose previous books of military non-fiction, “In Harms Way,” and “Horse Soldiers,” became New York Times bestsellers. “Horse Soldiers” is in development as a film by producer Jerry Bruckheimer (of Black Hawk Down, Pirates of the Caribbean, and Con Air fame) and will star A-list leading man, Chris Hemsworth. In addition, Stanton’s latest book, “The Odyssey of Echo Company: The 1968 Tet Offensive and the Epic Battle of Echo Company to Survive the Vietnam War,” will appear in the next few weeks. Novelist, nonfiction author, editor and essayist Colin Harrison will serve as guest host. Harrison’s nonfiction has appeared in The Washington Post, Chicago Tribune, Vogue, and numerous other publications. In the past 20 years, the farm-to-table movement has caught on in a big way with chefs, environmentalists, and consumers here in northern Michigan and elsewhere. The emphasis on farmers markets, heirloom fruits and vegetables, and locally sourced ingredients is now woven into many American’s daily lives. Along the way, Alice Waters, the chef who helped start it all at her Berkeley, California, restaurant Chez Panisse, has become a leading public policy advocate for healthful food. Her appearance dovetails with the Local Harvest Restaurant Series (Sept. 18–24), which will be held at various Grand Traverse-area restaurants. Waters, whose latest book is “Coming to My Senses: The Making of a Counterculture Cook,” will be interviewed by veteran chefs Jennifer Blakeslee and Eric Patterson, co-owners of Traverse City restaurant The Cook’s House. The event features an interesting twist: a few would-be authors selected from the audience will have a chance to pitch their dream magazine stories to McDonell. Guest host will be Doug Stanton, who helped co-found the National Writers Series. Daniel Gerber – poet, journalist, magazine collaborator (with Jim Harrison) – Friday, Oct. 27 - at Bluewater Hall - 13424 SW Bay Shore Dr.
Traverse City-based ForeWord magazine has called Daniel Gerber’s poems “quick, graceful, alert to their surroundings, and rarely wasting motion.” A Michigan State University graduate and Michigan Notable Book Award winner, Gerber’s latest volume of poems, “Sailing Through Cassiopeia,” adds to his long list of poems, essays, and journalistic reportage published over the years in The Nation, Poetry Magazine, The Michigan Quarterly Review, and The New Yorker. He has been nominated for two PushCart Prizes, received the Mark Twain Award in 2001, and in 1992 earned the Michigan Author Award. Gerber also co-founded the literary magazine Sumac with his friend and collaborator Jim Harrison. Host for the event will be former Interlochen Arts Academy director of creative writing, Michael Delp, who in addition to his active writing life serves a mentor to the Front Street Writers Program in Traverse City, which operates under the auspices of the National Writers Series. It could have been tough growing up as the only one of hockey legend Gordie Howe’s three sons who didn’t excel at sports. But Murray Howe ‘s upcoming memoir, “Nine Lessons I Learned from My Father,” shows how his father was much more than a sports icon. He portrays Gordie as a generous, grounded and principled father — one who showed true greatness on and off the ice. Those lessons took hold. Today, Murray Howe practices radiology as the head of sports medicine at a Toledo clinic. 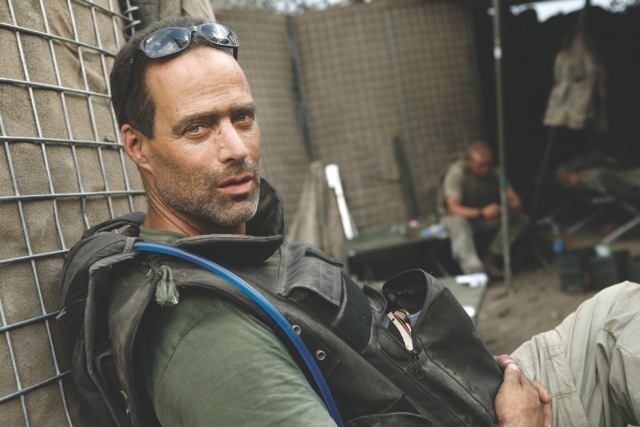 Sebastian Junger wears many hats. In addition to writing the nonfiction work “The Perfect Storm: A True Story of Men Against the Sea,” which was later adapted to film, he is also a filmmaker whose 2010 documentary, Restrepo, was nominated for an Oscar. More recently, Junger has become a well-established broadcast journalist due, in part, to his many TED talks. He returns to the National Writers Series to discuss his most recent book, “Tribe: On Homecoming and Belonging,” a study of war and its aftermath for veterans returning home. Junger will be interviewed by Marine Corps Vietnam veteran Philip Caputo, whose bestseller, “A Rumor of War,” is widely considered a classic retelling of personal war experiences. Caputo later become a member of a Pulitzer prize-winning Chicago Tribune team of journalists that uncovered election fraud in Chicago. He has written five books of general nonfiction and eight novels. His latest work, the novel “Some Rise By Sin,” will be published this year. America’s grande dame of poetry, Nikki Giovanni comes from a long line of southern storytellers. That heritage informs her highly expressive, simple, direct style and helps explain her appeal to young and not-so-young readers alike. Giovanni returns to the NWS with her about-to-be released book, “A Good Cry: What We Learn from Tears and Laughter,” which recalls family violence, her lucky escape to loving grandparents, and the gratitude she holds for her long friendship with poet and civil rights activist, the late Maya Angelou. Giovanni, a sought-after speaker, delivered a moving memorial poem for the shooting victims at Virginia Tech, where she serves as distinguished professor. Guest host for the evening will be Traverse City-based poet, author, and essayist Fleda Brown, whose works include “The Woods Are On Fire” and “Meditations on Cancer and the Creative Life.” Brown served as poet laureate of Delaware from 2001 to 20017, and has won a Pushcart Prize and the Philip Levine Prize, among other awards. She can be heard frequently on Interlochen Public Radio. Tickets for all NWS events are now on sale to Friends of NWS. Tickets for the general public go on sale Friday, Aug. 11, at 10 a.m., and are available by going to cityoperahouse.org, calling (231) 941-8082, or visiting the City Opera House Box Office, 106 E. Front St., Traverse City.